Last month we explored the phenomenon called “soda ash,” a layer of sodium carbonate that forms on the surface of raw soap whenever unreacted sodium hydroxide comes into contact with carbon dioxide in the air. The result is a layer of white powder that can be easily washed off with water, and easily prevented by covering raw soap with plastic film. But occasionally soapmakers come to me with a “soda ash” problem that does not wash off with water, and which forms despite covering the soap. While it appears similar to soda ash, this white layer is simply soap that is lighter in color than the soap surrounding it. 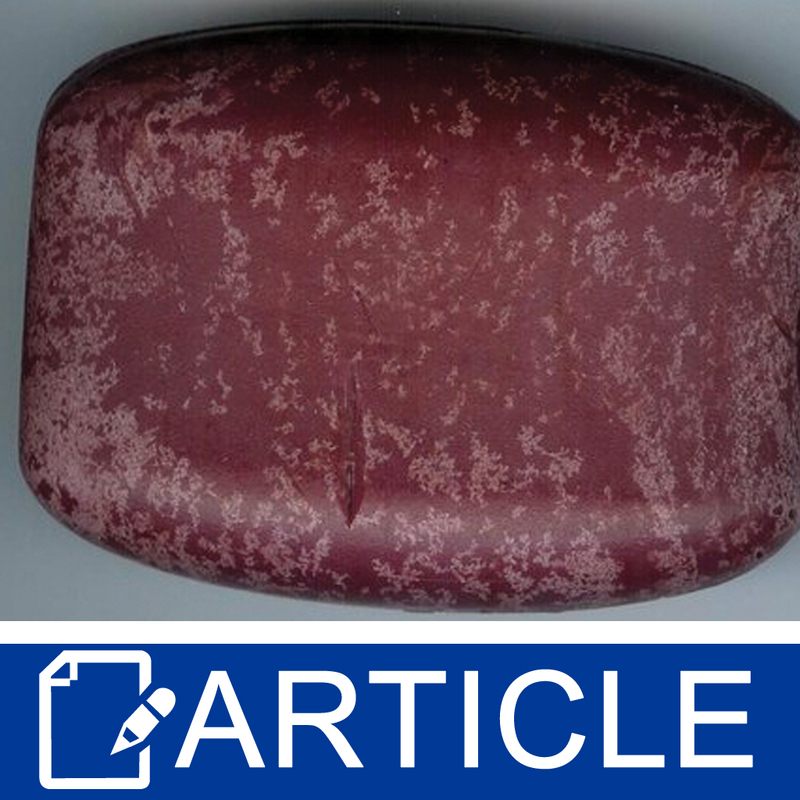 Figure 1 shows white soap crystals that have formed in a bar of palm oil soap colored with maroon oxide. Figure 2 shows a cross section. Unlike soda ash, these crystals are not just a surface feature—they appear on the interior as well, and they do not wash off with water. To understand this phenomenon it is important to recognize that soap is not a single compound, but a family of related compounds. All soaps are alkali salts of fatty acids. You can recognize their names on soap ingredient labels: sodum laurate, sodium myristate, sodium palmitate, and sodium stearate. These are the sodium salts of fatty acids with 12, 14, 16, and 18 carbon atoms, respectively. Any given oil molecule contains three fatty acid residues, and they may be different. Thus the saponification of any real world oil produces a mixture of soap molecules. Coconut oil soap, for example, contains primarily sodium laurate, but also contains sodium myristate and other soap molecules. Soaps produced from different oils have different properties because they contain different combinations of soap molecules. 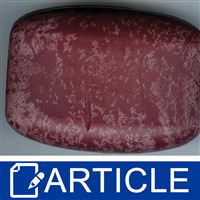 Raw soap typically starts in a liquid state and becomes solid as saponification proceeds, and as the soap cools. Generally, when liquids turn to solid, crystals form. They may be large crystals like diamonds or quartz, or they may be too small to see with the naked eye. If you look at table salt with a magnifying glass, for example, you will see that it consists of tiny cubes, the natural shape of the sodium chloride crystal. Some crystals are so small, they are visible only under the microscope. Crystals form when identical molecules (such as sodium chloride) pack together in an orderly pattern, and the particular pattern determines the shape of the crystal. Not every solid is crystalline, however. Glass is a non-crystalline solid, and so is ice cream. What makes them non-crystalline is that they are mixtures of different molecules. Ordinary window glass, for example, is actually a mixture of silicon dioxide, sodium oxide, and calcium oxide. Ice cream is a mixture of cream (itself a mixture), milk (another mixture), and sugar. If you try to make ice cream by simply mixing the ingredients and shoving it into the freezer, you are bound to be disappointed. You will find that it separates into layers, each layer containing a different component of the mixture. If you have ever accidentally let ice cream melt and returned it to the freezer, you will have seen the same behavior. And even ice cream that stays frozen is not immune—ice crystals form on the surface if you don't eat it fast enough. This is just the natural order of things. When liquid mixtures freeze into solids, they typically separate into their components. As crystals grow, identical molecules pack together, pushing aside the “alien” molecules that don't fit. And as the “alien” molecules congregate, they form crystals of their own. The larger the crystals, the more complete the separation, and the uglier the ice cream becomes. Left to its own devices, soap will also separate into crystals and for the same reasons. In its liquid state, the various soap molecules are all mixed up, but as the soap cools, each component begins to crystallize. If the cooling is rapid, there is not much time for separation to occur, and the crystals are too small to be visible with the naked eye. If soap remains liquid long enough, however, and particularly if there are areas of the soap at different temperatures, crystals may form that are large enough to see. If the top of the soap is cooler than the bottom, for example, the soap molecules with the highest freezing point will crystallize at the surface. As cooling continues, the soap molecules with the next lower freezing point solidify, and the process continues until the entire batch is solid. The key to avoiding separation in soap is the same as for making ice cream. An ice cream churn keeps the ingredients mixed until they are too solid to separate. The concept of “trace” is the soapy equivalent. We continue mixing the soap until it is too solid to separate. If you have a separation problem with a soap that does not gel, solving it may be as simple as pouring at a thicker trace. If your soap gels, however, the soap has a second chance to crystallize. The longer it remains in gel phase, the greater the chance of separation. If you oven process your soap, the solution to the problem may be as simple as taking it out of the oven sooner. If your molds are unevenly insulated, or if you stack them, the temperature may differ from one region to another, and soaps with different freezing points may crystallize in different regions. In this case, the answer may be as simple as paying more attention to insulation, or noticing a difference between soap from molds in the top, middle, or bottom of a stack. Since the freezing point of soap depends on the water concentration, increasing or decreasing the water portion may solve a soap crystallization problem. But the most imaginative solution to the problem is to turn it into a feature. If you get crystals consistently, you may decide that they provide a beautiful accent to your soap. "When soap has developed this crystal look, is it still safe to use?" Staff Answer The soap is completely fine to use. It is more an aesthetic issue than anything.